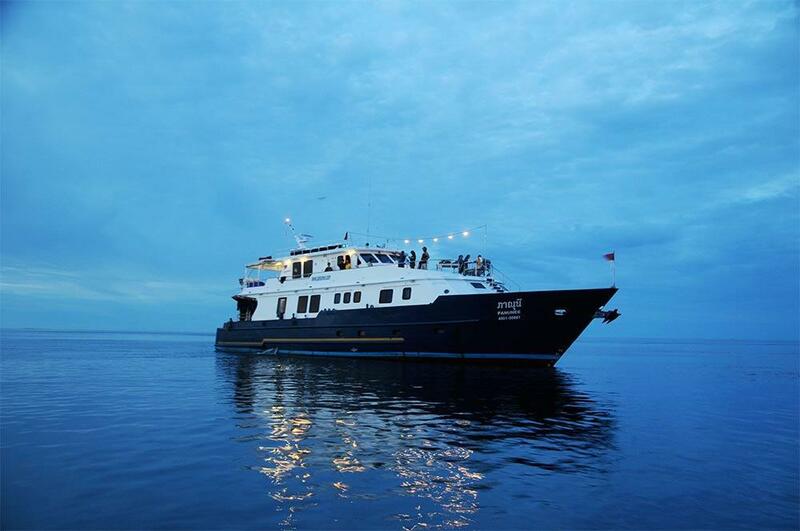 One of the most prestigious and easily-recognizable diving cruise ships at the Komodo Islands is Panunee. 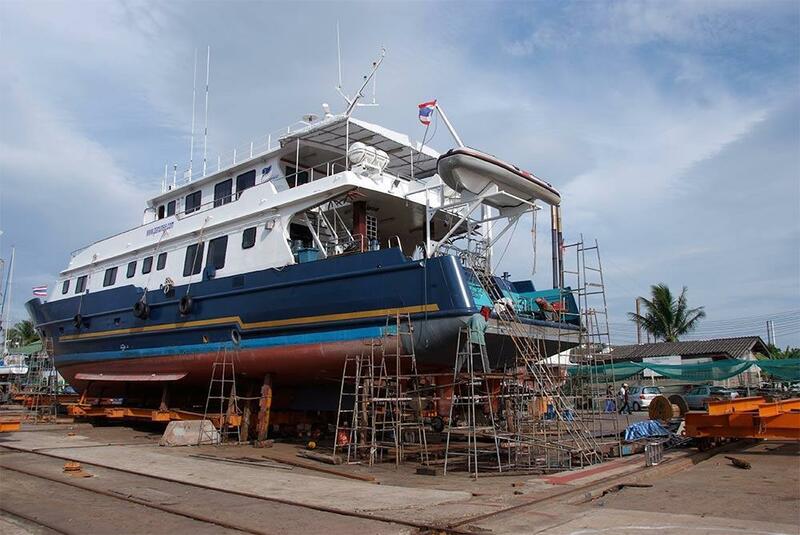 This large boat was designed & built specifically for diving safaris around Southeast Asia. 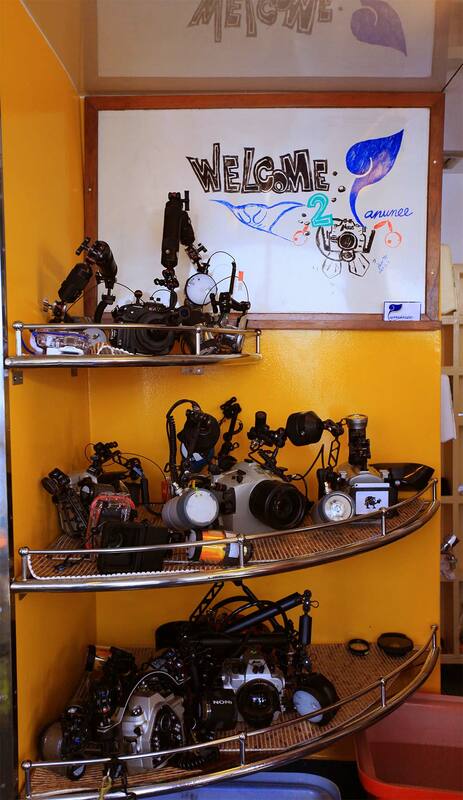 Divers come from all over the world to join Panunee’s diving safaris at the best locations around Indonesia. There is just the right balance of luxury & value. 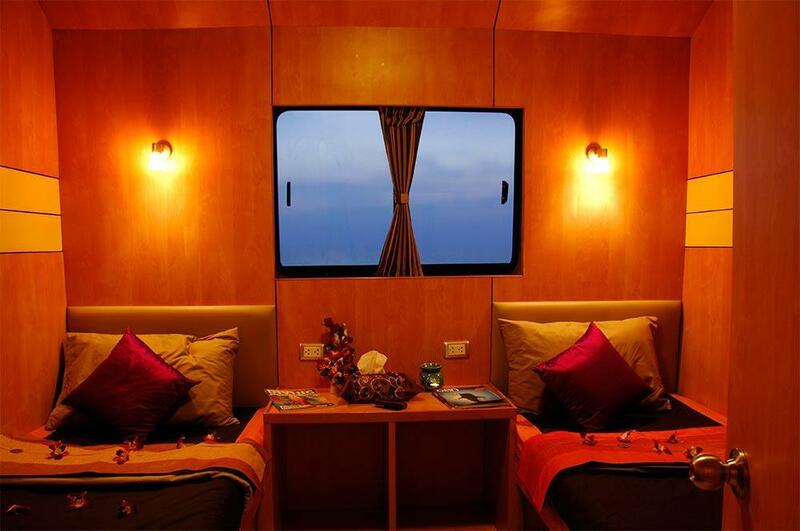 Guests can choose from double-bed cabins with private en suite bathrooms, twin deluxe, or studio cabins. All cabins have individually-controlled air-conditioning and there are lots of comfortable air-conditioned indoor and outdoor communal areas. 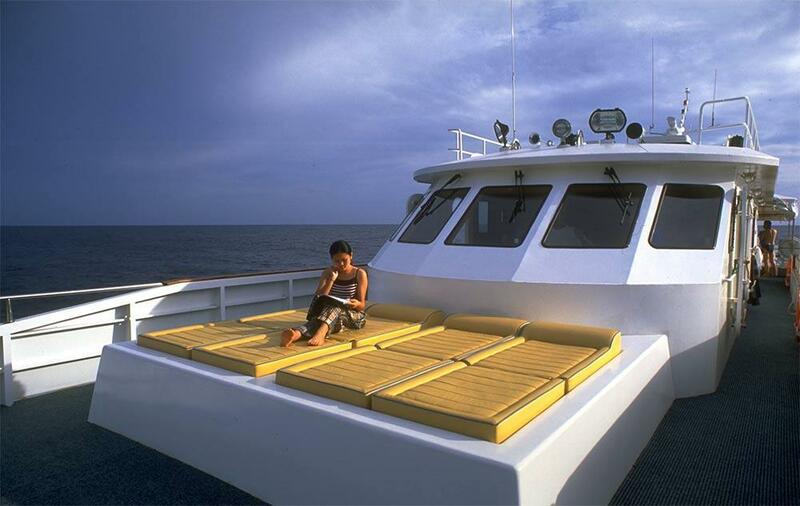 Panunee is a large, comfortable diving boat, and its size also provides safe & comfortable journeys in any sea conditions. 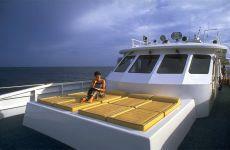 Diving from a large liveaboard boat has no disadvantages at all for guests. 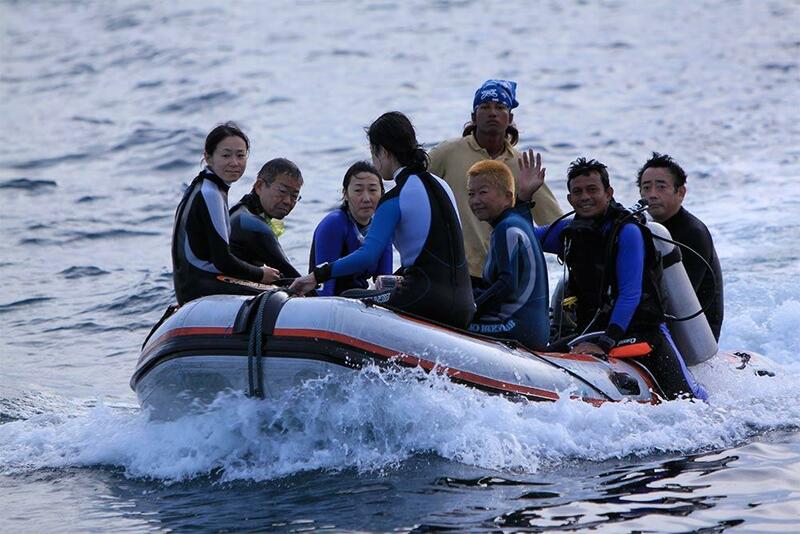 There are motorized tender dinghies to pick divers up, and to transfer passengers to the islands, including excursions to visit the famous Komodo Dragons in their natural habitat. 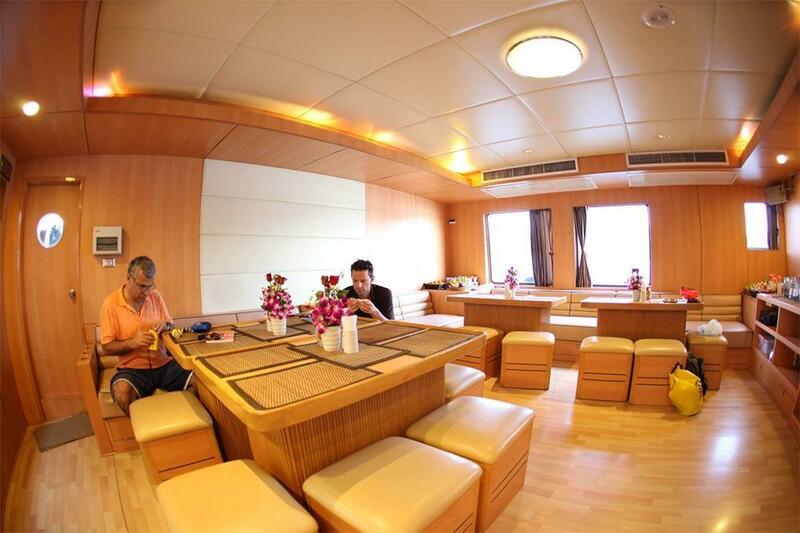 The boat’s main deck is where the luxurious suite rooms look out across the bow and home to three deluxe rooms. 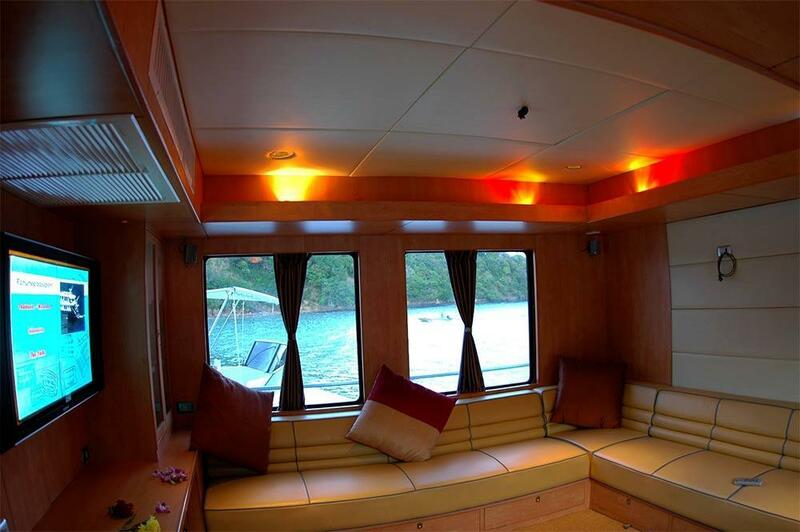 On the lower deck there are five more deluxe rooms & two single cabins, which are ideal for photographers. 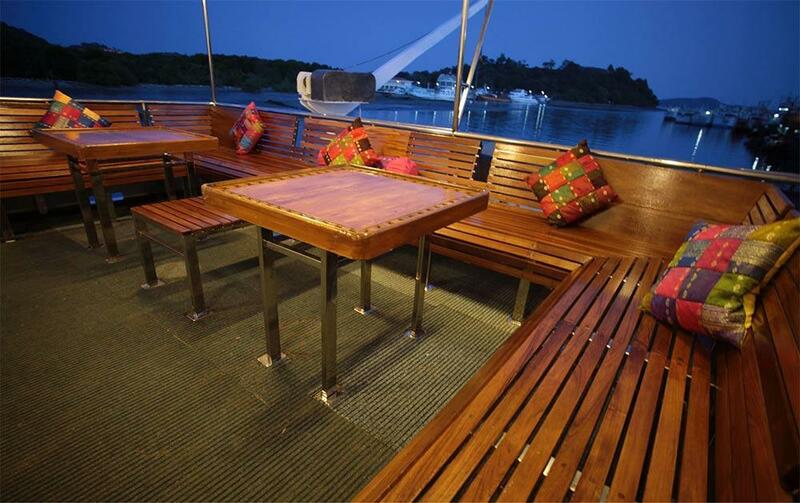 The top deck is where guests sunbathe and enjoy evening barbeques. Towards the back of the upper deck guests will find the Andaman Multimedia Room (air conditioned) and the open-air lounge. 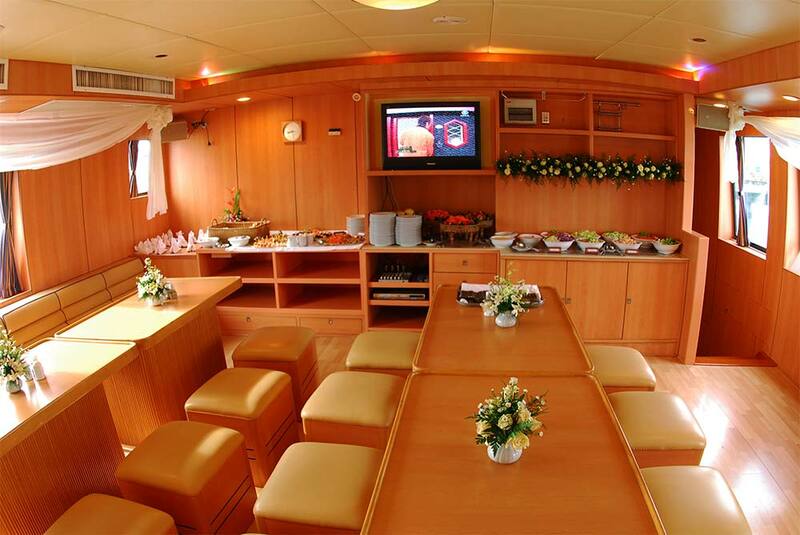 Most meals are served down on the main deck, inside the ‘Similan Dining Lounge.’ The boat also has a camera station room for photographers to store, play with and clean their equipment. 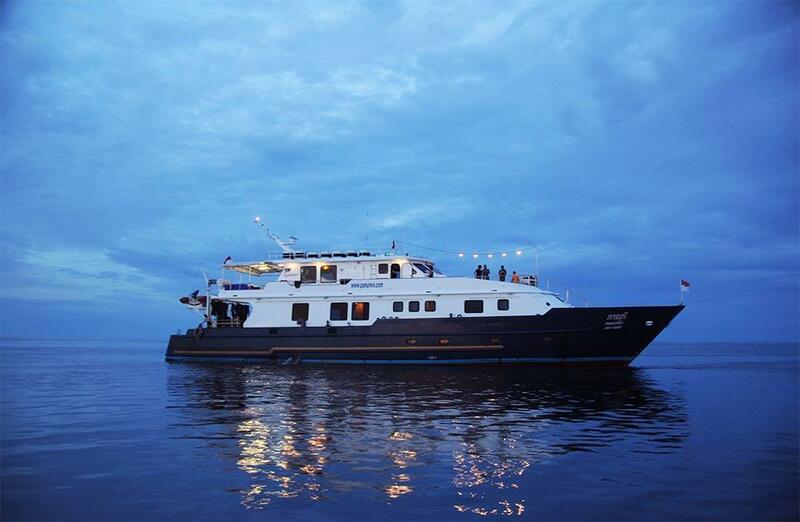 Diving from Pannunee is safe, comfortable and enjoyable, mainly due to the boat’s design and the staff & crew. There is a huge dive platform, with lots of space to move around before or after a dive. Naturally, Nitrox is available, and there are plenty of rinse tanks for photographers. To see more information, such as pictures, schedules, rates and specifications, just click on the tabs above this text. Panunee has several itineraries, so please check carefully from the list below to find the itinerary that matches your chosen trip(s) from the schedule. Suite. 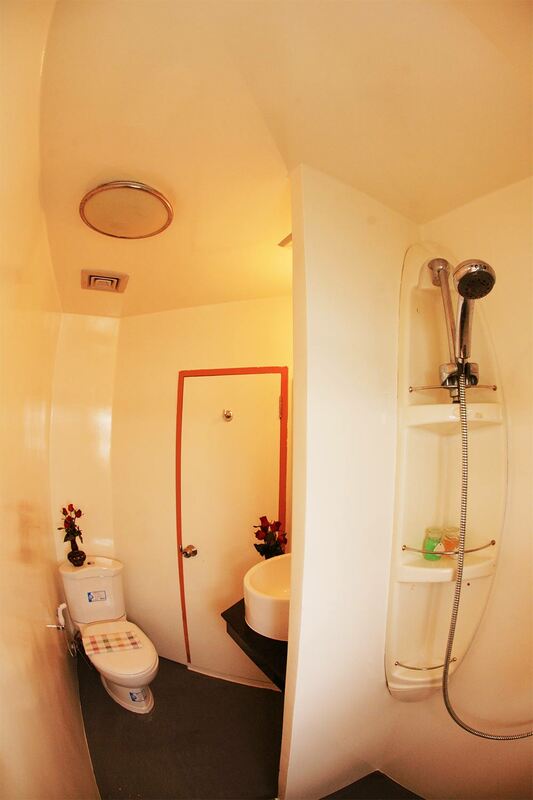 2, With En Suite Shower & Toilet. Deluxe. 8 (3 On The Main Deck And 5 On The Lower Deck.) Main Deck Cabins Have Windows. Studio. 2 (Special For Photographers / Videographers). Water Supply. Water Tank = 15,000 Litres. Desalination Machine = 4,000 Litres / Day. A/C - Individual Control. 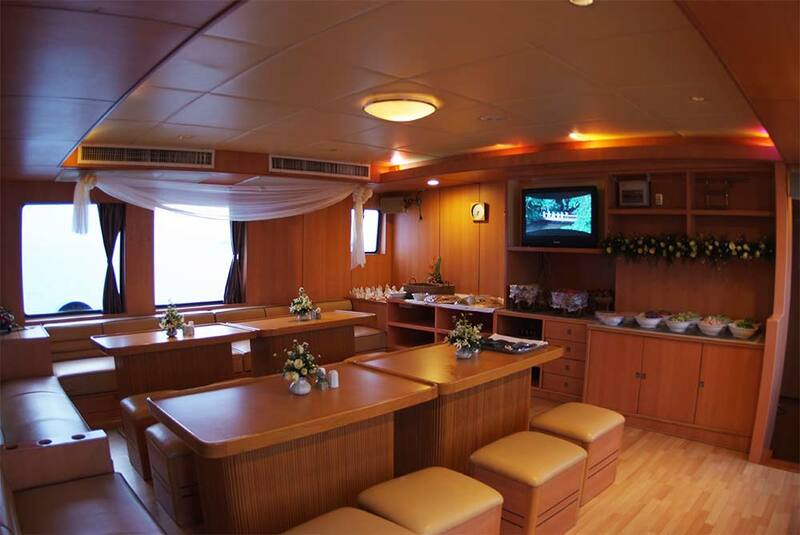 All Staterooms And Communal Area. Video & Audio. 42" Samsung, DVD Player & Slide Projector In Andaman Room (multi - Media Room & Library) 29" Tv & DVD Player In Similan Room (dining Room). Gear Box. ZF IRM 350 A Ratio 2636 : 1 . Life Raft. 2x 12 - Person Automatically Inflated. PFDs. 40x Type - I Commercial Life Vests. Fire Extinguishing System. 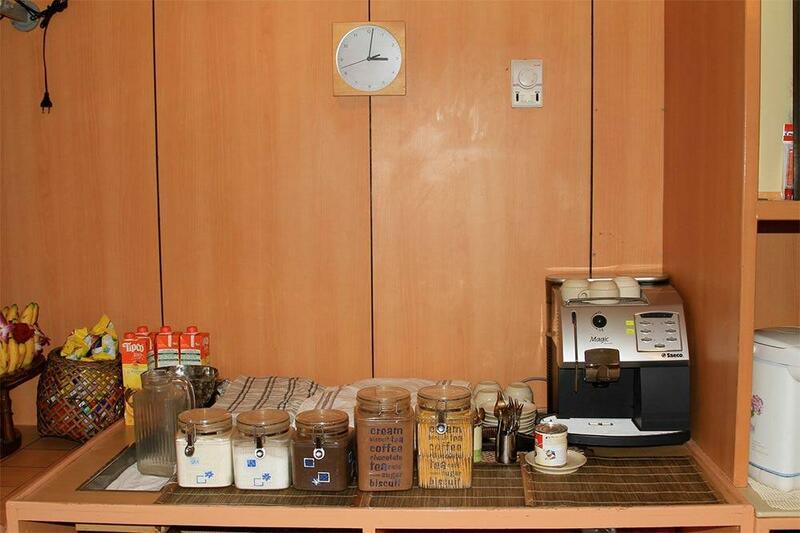 In Engine Room And Common Areas. Oxygen. 2x DAN Portable & 2x DAN Stationary. First Aid. Comprehensive First Aid Kits Available On Board. Emergency Power. Lighting, Ship Communication And Navigation System. 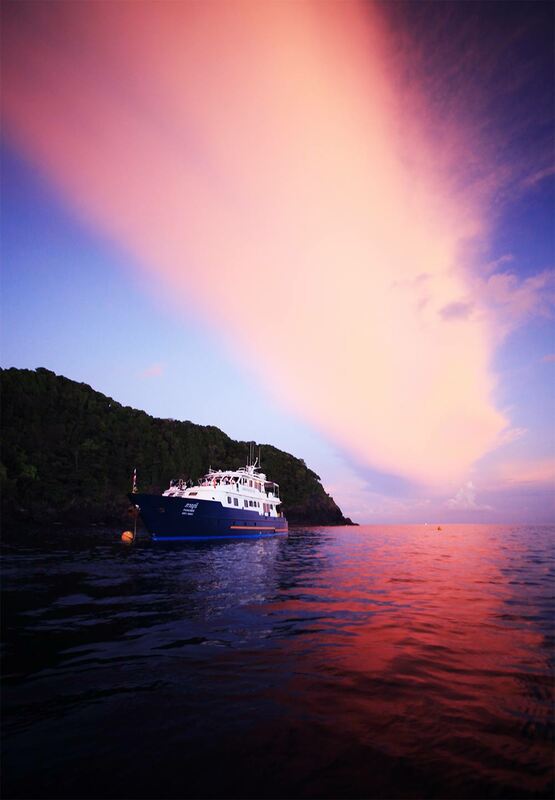 If you would like to take part in a PADI or SSI course while on board Panunee, please let us know well in advance. 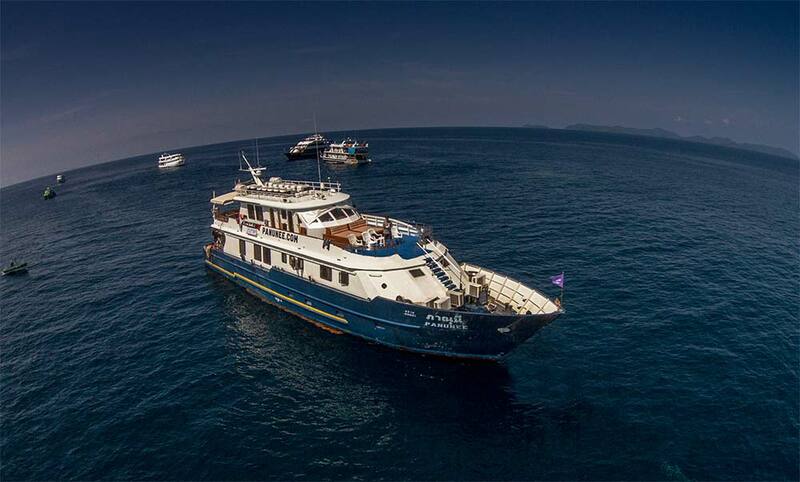 Unlike most other liveaboard diving boats in Southeast Asia, Panunee’s guests mostly join the cruises just for fun diving and courses are not as common as on other trips. However, with enough notice it may well be possible for us to arrange a diving course for you on this boat. Normally, there are free transfers from local hotels and the nearest airport on departure day. These are often at set times. 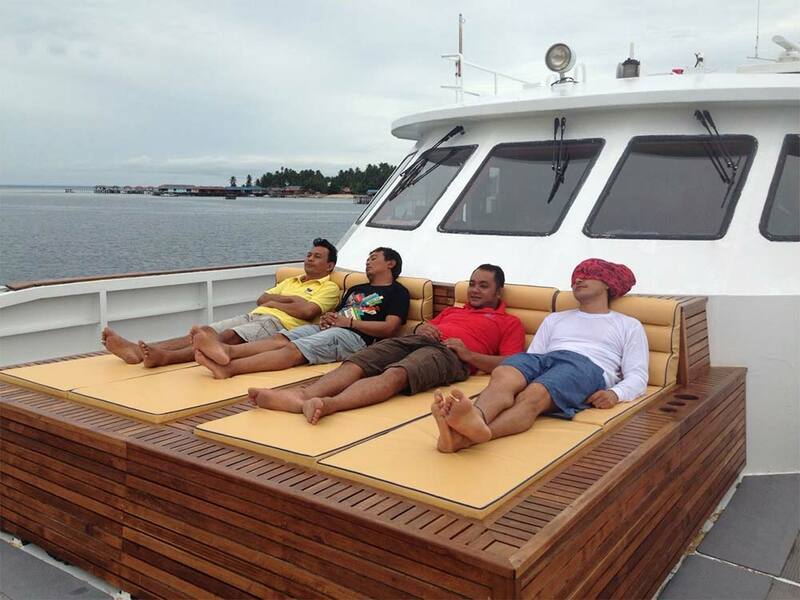 At the end of the trip, guests disembark after breakfast and the Panunee team transfer them to local hotels or the nearest airport.